“Core values make us who we are; awards inspire us to be even better”. As 2015 comes to a close, R.E.A.L Education Group crowned its 30th anniversary year with a string of awards from various acclaimed establishments that validate the Group’s efforts and accomplishments throughout the year. R.E.A.L Education Group recently bagged the ‘Employer of Choice’ silver award by the Malaysian Institute of Human Resource Management (MIHRM) at the 16th Malaysia HR Awards. There was double cause for celebration when Mr. Kenny Sim, Vice President of Group Corporate Resources, also picked up a silver award for ‘HR Leader of The Year’. The Malaysia HR Awards bestows recognition to various companies for their impressive contributions to the HR industry and communities at large such as discovering and developing new talents. These accolades serve as testament to R.E.A.L’s focus on personal growth, steadfastly driven by its Human Capital Centre (HCC) via the ‘4R’ model –namely Recruit, Retrain, Reward and Retain. With particular emphasis on ‘Retrain’, R.E.A.L offers a plethora of widely-recognised training programmes that develop pedagogical competencies, leadership skills and soft skills for staff of all levels to benefit from. This affirms R.E.A.L’s commitment towards enhancing and advancing its human capital potential. 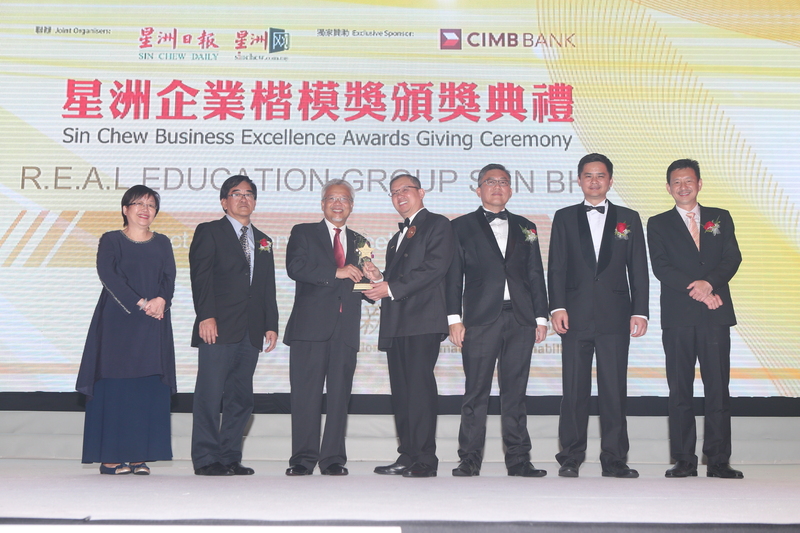 The beginning of November was a historic one for R.E.A.L Education Group as the company bagged its inaugural Sin Chew Business Excellence Award (SCBEA) under the ‘Product and Service Excellence’ category. Accepting the award during the Awards Presentation Ceremony was Group President, Mr. Ee Ching Wah. The event, organized by Sin Chew Daily took place at The Place @ One City in Subang Jaya. Acknowledged as one of the most trusted and eminent business awards in the country; winning the Sin Chew Business Excellence Award is high recognition and testimony for any business establishment. This attracts a large number of participants every year from companies both big and small across various industries. For R.E.A.L, being a winner in its category reflects the strengths of the company and how it defines itself as well as differs from competitors. Strategies and management disciplines were among the other criteria that were taken into consideration. 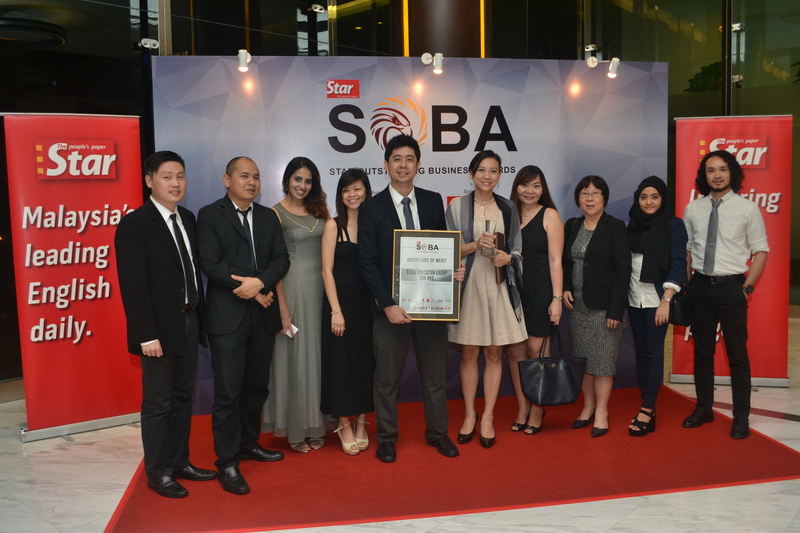 The month of November ended in style with R.E.A.L Education Group gaining more recognition at the prestigious Star Outstanding Business Awards (SOBA) organised by The Star at Bangsar South City, Kuala Lumpur. SOBA is reputable and renowned for recognising striving Malaysian enterprises and awarding their contributions to the nation’s economical growth. Likewise, the objective of this award programme is to promote and support local enterprises to achieve global standards in their products and services. R.E.A.L received the “Most Promising Award” and a “Certificate of Merit”, the latter for being finalists in the ‘”Best Brand” and “Best in CSR” awards. In what was essentially R.E.A.L’s maiden attempt at SOBA, it was certainly a commendable feat to be finalists in both categories which R.E.A.L participated in. It was also sound recognition of the company’s sterling efforts and achievements throughout the year, while serving as a launching pad for further growth and success.